Daktronics has continued a long-standing relationship with the University of Georgia to design, manufacture, and install a new LED video display and Show Control System for Sanford Stadium in Athens, Georgia. 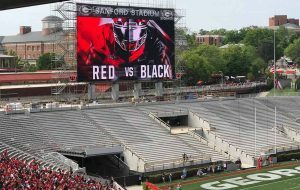 The new technology was installed prior to the G-Day Spring Game and will be fully debuted this fall for the 2018 football season. The new end zone display features a 13HD pixel layout, the same technology used by many professional football teams. The Bulldogs display measures 52 ft. high by 100 ft. wide, 30% larger than the previous display, to bring a massive visual experience to fans, student-athletes, and coaches, alike. It brings crisp, clear imagery with wide angle visibility to every seat in the stadium. The new Daktronics Show Control System features an easy-to-use workflow that allows the new display to be used as one large canvas or it can be divided into multiple zones to show any combination of live video, instant replay, real-time statistics, graphics and animations, and sponsorship messages. Unlimited layering and keying enhance the overall production, allowing the university to build layers and key score bugs, fan prompts, and other elements over the top of video to deliver today’s modern broadcast experience. 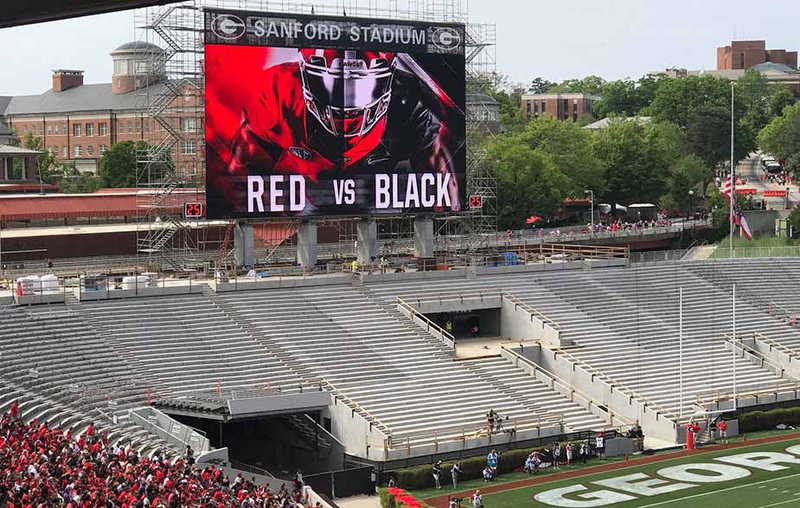 Some of the new functionality showcased during the G-Day Spring Game included key/fill, transitions between the different video looks and sources, as well as creating transitions from full video to a live squeeze back revealing the full canvas below. The show had more of a broadcast-type feel and was received well by the university — building on the excitement for what is yet to come this upcoming football season. In addition, the Bulldogs are working with Daktronics Professional Services team to have custom content developed and integrated, and to provide game-day production services. This marks 14 years of collaboration with the university providing live event support. The University of Georgia also uses Daktronics products and services at their venues for basketball, baseball, gymnastics, softball, soccer, volleyball, and practice facilities across campus.